In a blender, combine the avocado with the buttermilk, vinegar, shallot, parsley and garlic and process until smooth. With the machine on, add the vegetable oil in a thin stream and process until smooth. Season with salt and white pepper. Preheat the broiler and position a rack 8 inches from the heat source. In 2 large skillets, cook the bacon over moderate heat, turning once, until browned and crisp, about 6 minutes. Drain the bacon on paper towels, then break it into 1-inch pieces. Brush the bread on both sides with the olive oil and broil until toasted, about 45 seconds per side. Cut each slice in half diagonally. 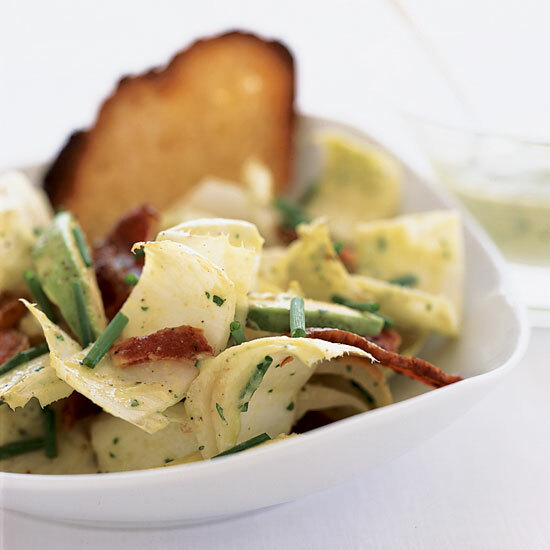 In a large bowl, toss the endives with 1/4 cup of the chives and the bacon. Add 1/2 cup of the dressing and toss until evenly coated; refrigerate the remaining dressing to use within 3 days. Season the salad with salt and pepper. Arrange the toast on 4 large plates. Mound the salad on top and tuck in the avocado wedges. Sprinkle the salad with the remaining 1 tablespoon of chives and serve.